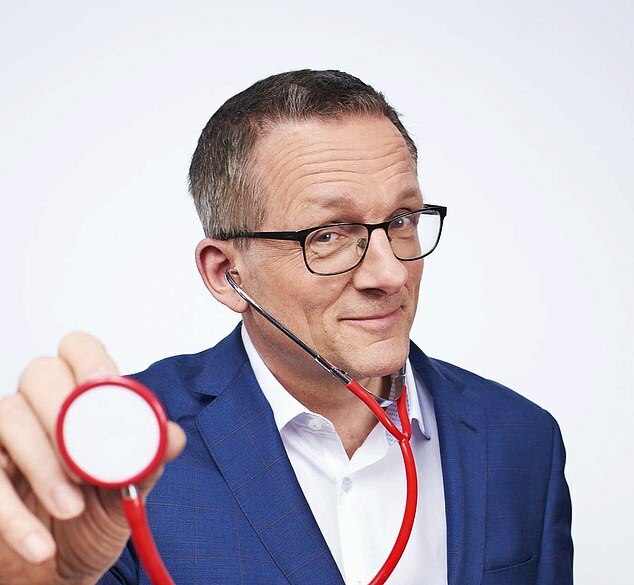 Over the six years since I wrote the Fast Diet, millions have found 5:2 intermittent fasting a great way to lose weight. People have also told me that they find it an easy plan to return to if the weight starts to creep back. But the original 5:2 was by no means perfect. So I’ve written a new book, based on lots of cutting-edge research, which I believe has made this approach to weight loss even more flexible and doable. The result is the Fast 800, which has been serialised all this week in the Daily Mail. One of the changes I’ve made is to increase the recommended levels of calories to 800 on fasting days. This figure is high enough to ensure you get all the nutrients you need and don’t feel hungry, but low enough to trigger the metabolic benefits of fasting. I also now recommend making your fasting days easier — and more effective — by narrowing your daily eating window to around ten hours a day. The great thing about intermittent fasting is that it doesn’t require you to give up many food groups or buy lots of expensive ingredients, and it’s something you can dip in and out of as your weight naturally fluctuates through life. Nearly seven years ago I lost 20 lb and returned my blood sugars to a healthy level by adopting this approach. I’m proud to say I’ve remained the same healthy weight since, by sticking to a largely Mediterranean-style diet, which is naturally quite low in carbohydrates. I extend my night-time fast as often as I can, and I do throw in a few 800-calorie fast days to get everything back on track if I ever end up with a period of over-indulging. Let’s be honest here — losing weight and then keeping if off is not easy. But it can be done! So once you have hit your targets, make sure you celebrate. Tell your friends. You have achieved something really important for your health and your longevity. 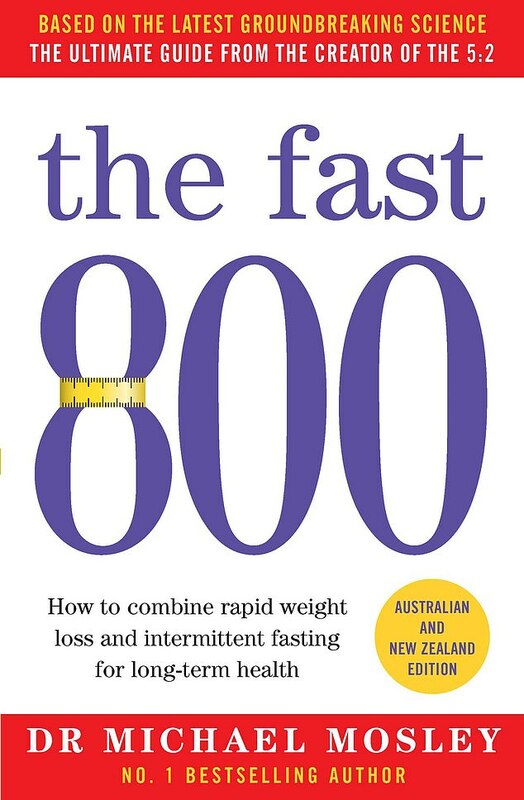 By using my Fast 800 programme to lose weight, you will have lost lots of harmful visceral fat from around your organs, and you will have reduced your risk of many chronic diseases. If you had high blood pressure, you should have seen significant improvements and your cholesterol profile is likely to be looking better, too. Many people with type 2 diabetes or pre-diabetes tell me their blood sugar levels have returned to normal, without medication. People with a fatty liver will have seen their liver health transformed (rapid weight loss is the only effective treatment for Non-Alcoholic Fatty Liver Disease, also known as NAFLD). There are plenty of other benefits too. Intermittent fasting has been shown to reduce inflammation, improving conditions such as arthritis, eczema, psoriasis and asthma. Once you reach your target weight, you can relax a little and fit in a few ‘treat days’, but do go carefully. Occasional lapses are absolutely fine, but be warned: if you return to your old ways, you will inevitably return to your old pre-diet body. If you’re happy on a 5:2 regime, there is no reason why you shouldn’t stick to that or switch to the ever-popular 6:1 (where you fast one day a week) long-term. This is an excellent option for keeping your body in good shape, particularly if you haven’t found intermittent fasting too stressful. If you found Time Restricted Eating suits you, there is no reason why you shouldn’t keep going long-term too. Most people find 10:14 (eating only within a ten-hour window and extending your overnight fast to 14 hours) or 12:12 is doable, albeit with occasional lapses. If you find yourself having a late-night meal/snack/drink one day, then delay your breakfast the next day to extend your fast. One of the very important aspects of my new Fast 800 regime is the fact that it encourages you to eat healthy food. 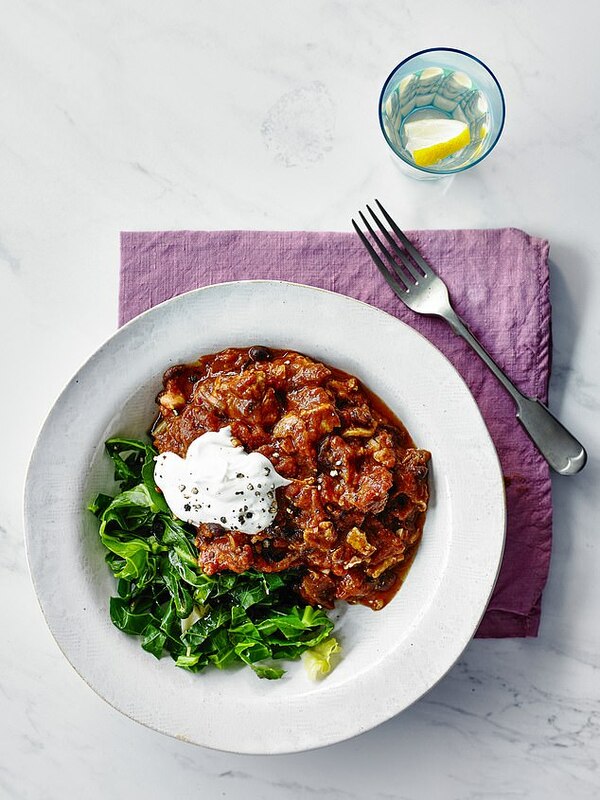 The recipes, created by Dr Clare Bailey and nutritionists Joy Skipper and Justine Pattison, are based on a Mediterranean-style diet, which is rich in healthy natural fats, nuts and fish, as well as vegetables and legumes, and packed with disease-fighting vitamins and minerals. This abundance of fresh ingredients means the food you make tastes as good as it looks, but it also boosts your health, so I urge you to continue to eat according to Mediterranean diet principles when you successfully lose weight. There is so much solid scientific evidence that adopting this lifestyle cuts your risk of heart disease, cancer, type 2 diabetes, depression and dementia. Even when taken up later in middle age, it has been shown to increase life expectancy. In 2013, a major Spanish study of 7,400 overweight, middle-aged Spanish men and women found that those who stuck most closely to a Mediterranean diet stayed slimmer and healthier, slashing their risk of a multitude of diseases (risk of a heart attack or stroke reduced by 30 per cent, type 2 diabetes by 58 per cent, breast cancer by 51 per cent and a lower risk of cognitive decline). All volunteers were given an ‘M score’, according to how closely they stuck to the Mediterranean diet. It’s definitely worth aiming to keep your M score as high as possible. 1. Reduce sugars and starchy carbs: Cut right back on sugary starchy foods, such as cakes, sweets, biscuits, crisps, fruit juices and soft drinks, as these rapidly turn into sugar in your blood, causing sugar spikes, a surge in insulin and weight gain. Aim to have them less than twice a week. Potatoes, bread, white rice and white pasta. Most breakfast cereals and ‘instant oats’ (rolled oats are OK). Sweet, tropical fruits such as mangos, pineapples, grapes, melons and bananas as these are high in sugars (fructose). Instead, opt for berries, apples or pears. Aim for a maximum of 1-2 pieces of fruit a day, ideally after a meal. Minimise processed foods. More than 70 per cent of processed foods contain added sugars. You have to read the labels, though the problem is that there are more than 70 different names for sugars. 2. Increase consumption of natural healthy fats: Enjoy healthy fats in foods such as olive oil, salmon, tuna, full-fat dairy, avocado, nuts and seeds. These natural fats are good for the waist and the heart, and will keep you feeling full for longer. 3. Eat decent amounts of protein: This means eating generous amounts of foods such as oily fish, seafood, chicken, some red meat, eggs, tofu, beans, pulses, dairy and nuts (at least 50-60g of protein a day, every day). But restrict your intake of processed meats such as sausages, bacon and salami, as these are not particularly healthy sources. Most contain high levels of salt, nitrates and other preservatives. 4. Eat plenty of green and coloured veg: It is especially important to eat plenty of dark-green leafy vegetables such as spinach, broccoli, cabbage, kale and salads, as well as coloured vegetables — these are very low in calories and contain many essential vitamins and nutrients. They also contain lots of fibre, from which the ‘good’ microbes in your gut will benefit. 5. 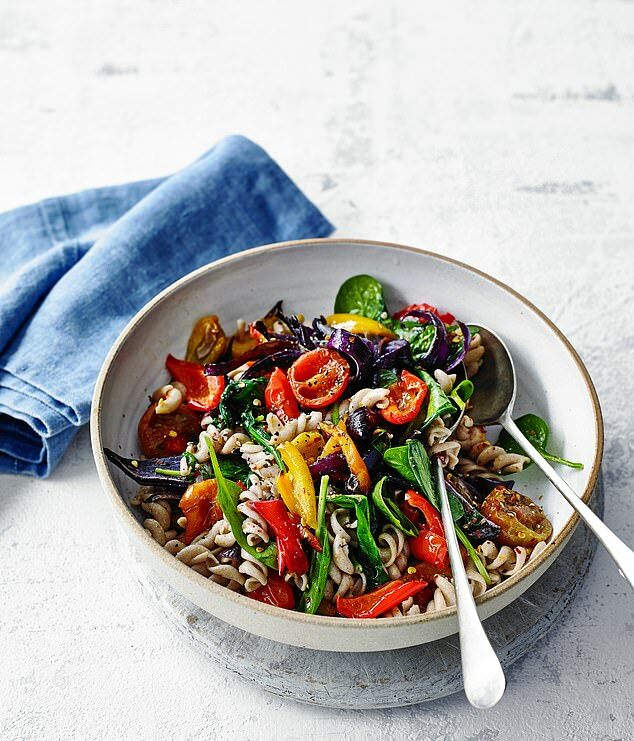 Swap to wholegrains and pulses: Eat more ‘complex carbohydrates’, which are high in fibre. This means swapping white pasta and rice for wholegrains and pulses such as lentils, beans, quinoa, wild rice and buckwheat. Choose multi-grain, seeded or rye bread over white. Again, the good bacteria in your gut will thrive on the fibre in these foods. But during both the rapid weight loss and 5:2 stages of the diet you should keep your intake of wholegrains down. That’s because you want to go into mild ketosis and eating grains will stop that happening. 6. Avoid snacking between meals or late-night grazing: Grazing stops fat burning. If you must, snack on non-starchy vegetables such as broccoli, cucumber or celery, or a small handful of nuts or a small piece of cheese. Fruit is not a good choice, particularly when you are trying to lose weight. 7. Drink healthily: Plenty of black tea, fruit tea, black coffee, water. As for alcohol, an occasional glass of red wine with a meal is OK on non-fast days. The Mediterranean diet is more than a list of set ingredients. It’s about developing a set of habits and making permanent changes to your lifestyle. It involves cutting back on processed, ready-made and fast foods, and instead opting for whole-food meals cooked, where possible, from scratch. And it is about eating food slowly and enjoying it with family and friends. Too often we eat without taking the time to appreciate what is going in our mouths. So don’t eat your meal in front of the TV. Make the effort to savour it fully. So many of the recipes in this series can be expanded and enhanced and portion sizes increased to ensure they can be enjoyed by everyone in the family. Try these further suggestions for how to increase protein content or make a meal more satiating on your non-fast days and/or when you reach your target weight. Olive oil and cider vinegar dressing for 2 people: whisk 2 tbsp extra-virgin olive oil with 1 tbsp live cider vinegar and some salt and freshly ground black pepper (100 cals per serving). Dressings are a great way to liven up broccoli and leafy greens. Drizzle of olive oil. Use good-quality extra-virgin olive oil if you can, and don’t worry about calories. Your body needs it for vitamins and energy. Remember, fat does not make you fat! Many of the recipes in this series are low in carbohydrate to stimulate fat burning. 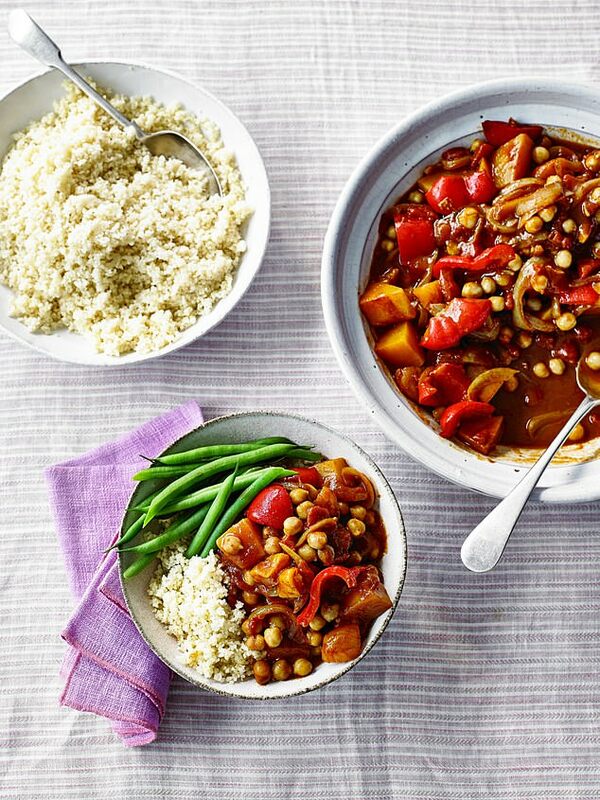 But on non-fast days and when you have reached your target weight you can re-introduce wholegrains and pulses, such as brown rice and lentils. These complex carbohydrates contain beneficial quantities of fibre which feed the microbiome in your gut, leading to the production of substances that reduce inflammation, lower blood sugars and improve health. 1. Preheat oven to 200c/180c fan/gas 6. Put peppers, courgettes and onion into a large baking tray. Drizzle with oil, season and toss together. Roast for 20 minutes. 2. Take the tray out of the oven and turn the vegetables. Add the tomatoes and sprinkle with chilli flakes. Cook for 10 minutes or until the vegetables are brown. 3. While the vegetables are roasting, half-fill a saucepan with water and bring to the boil. Add the pasta and stir. Simmer and cook for about 10 minutes or until tender. 4. Drain the pasta in a colander and return to the pan. Add the spinach and roasted vegetables. Toss well together and season. More substantial: Sprinkle with 20g freshly grated Parmesan cheese and serve with a leafy salad. 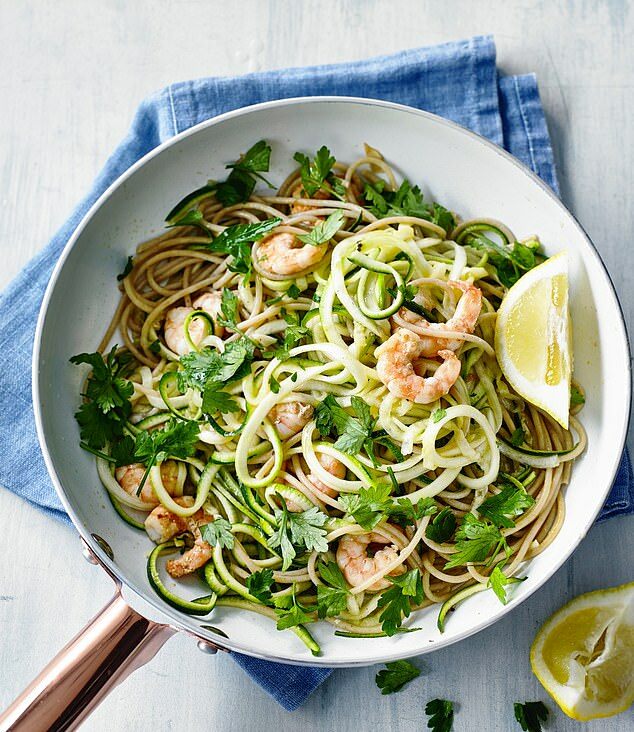 The combination of courgetti and spaghetti works really well here — giving the dish more body, while keeping the calories low. 1. Cook the spaghetti according to the packet instructions, ensuring it remains al dente. Drain it, reserving the water. 2. Meanwhile, place the oil in a medium-sized frying pan over a medium heat. Sweat the garlic in it for 30 seconds, then stir in the prawns and cook them for about 3 minutes, before adding the courgetti. 3. Keep stirring for 2-3 minutes, and once the courgetti start to soften, add the spaghetti to the pan with a generous squeeze of lemon juice and 1-2 tbsp of the reserved pasta water (or hot water) to loosen the mixture. Bring the pan to a gentle simmer, then remove it from the heat. 4. Season it with some salt and plenty of freshly ground black pepper. Stir in the chopped parsley and divide the mixture between 2 bowls. LOWER CAL: Skip the spaghetti and use larger courgettes (this reduces the calories by about 100 per person). NON-FAST DAY: Double the portion and add a large handful of salad leaves with a dressing. 1. Preheat the oven to 200c/180c fan/gas 6. Trim off most of the visible fat from the chicken thighs and cut into chunks. 2. Heat the oil in a medium flame-proof casserole dish and add the onion, bacon and chicken. Season with a little sea salt and lots of freshly ground black pepper. Cook for 5 minutes, stirring regularly until the chicken is lightly coloured on all sides and the onion is browned. Stir in the tomatoes and 400ml cold water. Add the carrots, tomato puree, crumbled stock cube and dried herbs. 3. Bring to a simmer then cover with a lid and cook in the oven for 30 minutes. Take carefully out of the oven and stir in the courgette pieces. Cover and return to the oven for a further 15 minutes, or until the chicken is tender. Just before the chicken is ready, cook the cabbage in boiling water; drain well and serve alongside. More substantial: Cook 50g brown rice (70 calories) per person to serve alongside. 1. Preheat the oven to 180c/160c fan/ gas 4. Heat the oil in a medium flame-proof casserole and cook the onion over a medium heat for 2 minutes. 2. Add the pork and bacon to the pan, season with ground black pepper and cook for 5 minutes, stirring constantly. Add the spices and cook for a few seconds more, stirring. 3. Tip the tomatoes and beans into the pan. Add the tomato puree, Worcestershire sauce and crumbled stock cube. Pour over 300ml water, season with a little sea salt and lots of ground black pepper. 4. Stir well and bring to a gentle simmer. Cover with a lid and cook in the oven for about 1 ½ hours or until the pork is very tender and the sauce is thick. Serve topped with Greek yogurt. 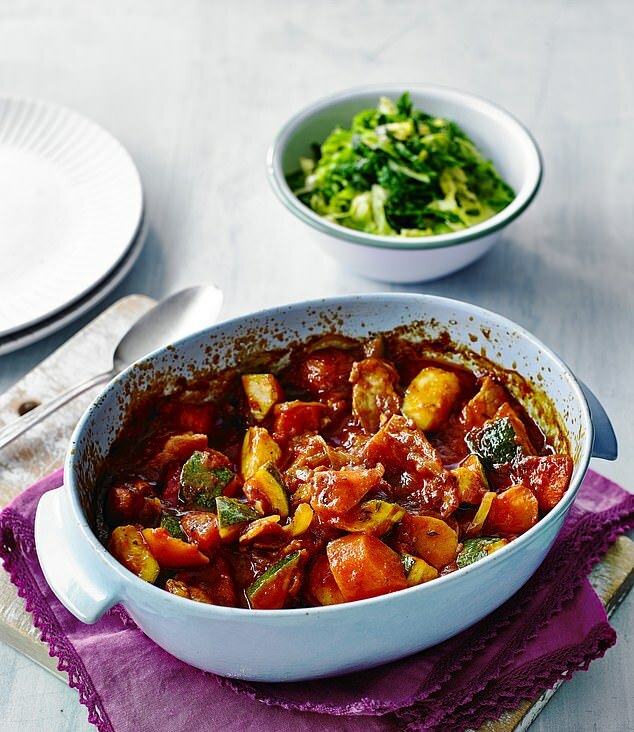 More substantial: Serve with freshly cooked cabbage, kale or spring greens and cook 120g brown basmati rice per person. 1. Heat the oil in a large non-stick frying pan, or saute pan, and fry the mushrooms over a medium-high heat for 3-4 minutes, until lightly browned. Add the spring onions and cook for a few seconds more. 2. While the mushrooms are frying, cook the broccoli and cabbage according to pack instructions. 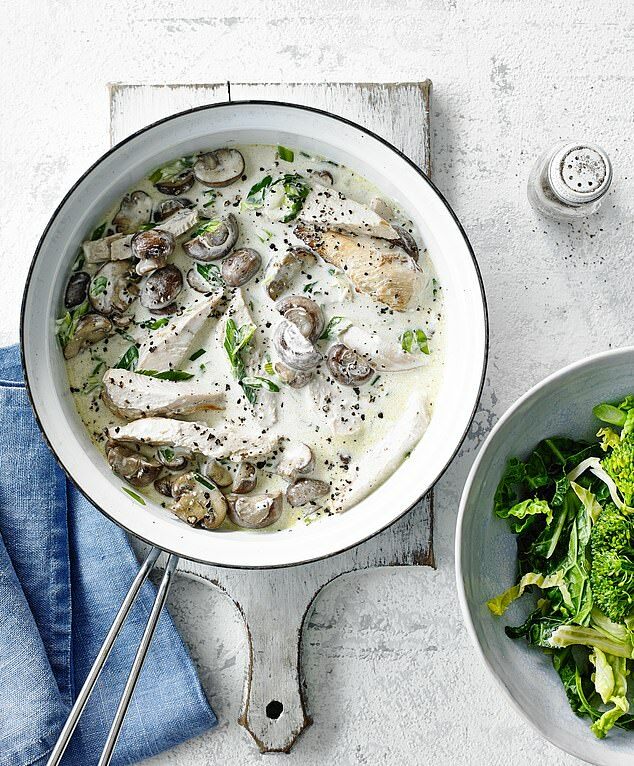 Add the sliced chicken and stock to the pan with the mushrooms and bring to a simmer. Cook for 3 minutes or until the chicken is hot and the stock has reduced by around half, stirring occasionally. 3. Stir the creme fraiche into the chicken, then remove from the heat and season with black pepper to taste. Serve with the freshly cooked vegetables. 1. Mix the cumin, coriander, paprika, a pinch of sea salt and ground black pepper on a plate. 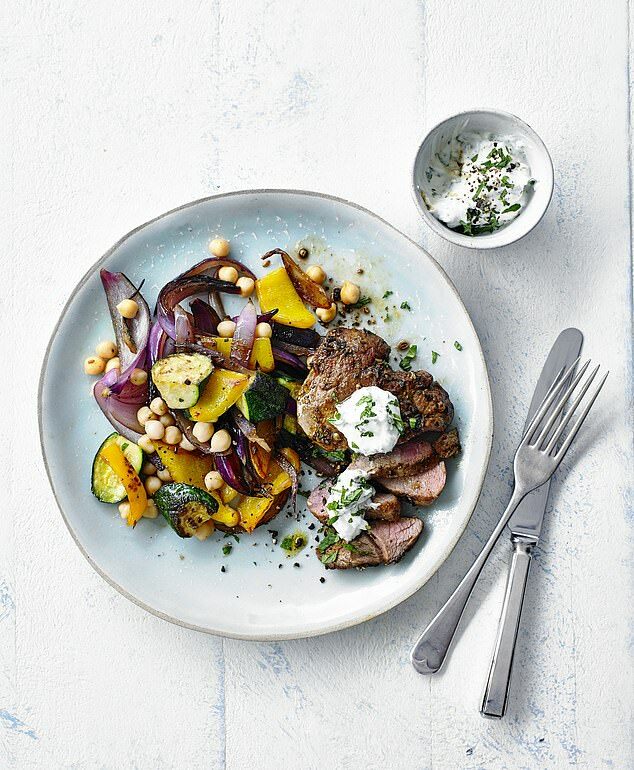 Coat the lamb steaks on both sides with the spice mix. Mix the yoghurt, garlic and mint together and add just enough cold water to make a drizzly sauce. 2. Heat 1tbsp of the oil in a large non-stick frying pan and fry the onion, pepper and courgette for 4 minutes, stirring regularly. 4. Leave to stand for 5 minutes, then divide between two plates and drizzle with the yoghurt sauce. More substantial: Take the steaks out of the pan once cooked and add 400g of drained and rinsed chickpeas to the vegetables. Stir fry for a couple of minutes until hot. With the smoky bitterness of scorched chicory, the tang of mustard and the crunch of walnuts, this dish is a mouth-watering combination of textures and flavours. 1. Preheat the oven to 190C/170c fan/gas mark 5. Place the chicory in a medium-sized ovenproof baking dish cut side up. 2. Combine the olive oil and mustard in a small bowl, then spread it over the chicory. Cover the dish with foil and place it in the oven for 15-20 minutes. 3. 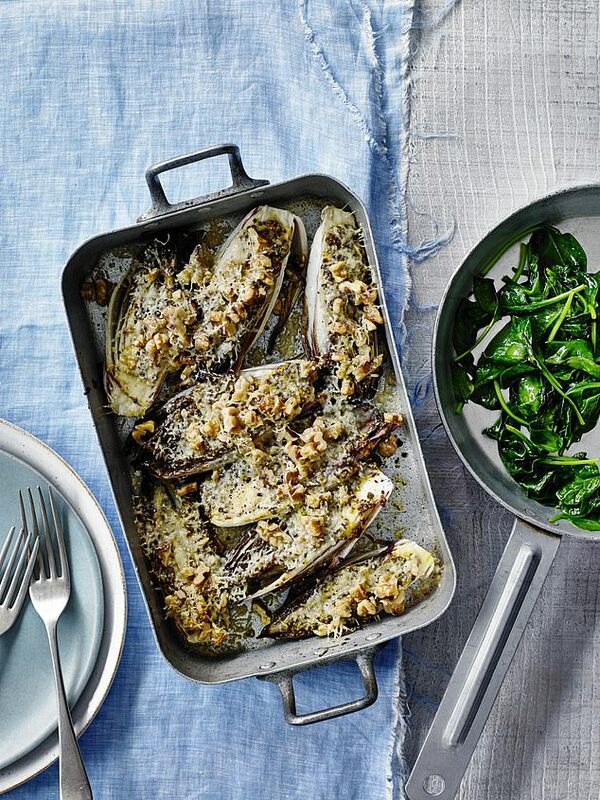 Remove the chicory from the oven and sprinkle over the walnuts, Parmesan and a generous grinding of black pepper. Bake it for another 10 minutes or until the chicory starts to brown around the edges. MORE SUBSTANTIAL: Add a large handful of baby spinach to each plate and place the roasted chicory bulbs on top, or wilt them for a few minutes in a non-stick pan first. NON-FAST DAY: Add 2-3 tbsp cooked brown rice or quinoa, or serve the chicory as a side. 1. Preheat the oven to 200C/fan oven 180C/Gas 6. Heat 1 tbsp of the oil in a medium flameproof casserole dish and gently fry the onion for 5 minutes, until softened and lightly browned, stirring regularly. Add the remaining oil, sprinkle with the ras el hanout and cook for a few seconds more, stirring constantly. 2. Add the pepper and squash, tomatoes, chickpeas, apricots and stock. Stir well, season with sea salt and plenty of ground black pepper and bring to a simmer. 3. Cover with a lid and cook in the oven for 45 minutes, until vegetables are tender and the sauce is thick. More Substantial: Serve with a large serving of green beans or a leafy salad on the side. Add a portion of cooked bulgur wheat for 13 calories per 15g tbsp.